It so happened that this year’s effort, our second, to make maple syrup coincided with the college basketball frenzy that is March Madness. It could not have actually been this way day after day, but my recollection of sap gathering is that it took place during a series of halftimes when the insights of basketball analysts were slighted in favor of a snowshoe trek into the woods. There, in front of each of our eight buckets, double the number used last year, either disparaging or encouraging words would be voiced based on the trees’ performance. A low performer, noted by a sap level that could be measured by the spoonful, might hear, “Hey, show me some game here. What are you waiting for, next year?” The high-producing trees — the gamers, the closers, the clutch players — would hear something like, “Are you kidding me? That’s what I’m talking about!” With proper admonishment and praise administered, it was back to the house with plastic bags full of sap. This year it was cold enough during sap-collection days to leave the bags of sap in the garage. With no need to devote limited freezer space to each day’s harvest, the collection could continue over a longer period of time. “Longer” is a relative term, of course. Last year’s collection lasted for a week, after which the freezer and the coolers could hold no more. This year the collection took place over about 3 weeks, leading up to a designated day during which no other commitments would prohibit hours of uninterrupted boiling. I’d say the total yield of sap was about 30 gallons. It’s a rather haphazard guess because some gallon bags were full, others were partially full, still others had leaked into the bottom of a cooler, and by the end we just brought the loaded buckets back without pouring the sap into a measuring vessel of any kind. In any case the increase over last year’s collection was significant. Why this fact didn’t immediately translate into the realization that the increase in boiling time would also be significant, I can’t say. The boil started on a snowy day, but the wet conditions were mitigated by the borrowing of a canopy placed over the fire pit. Having had the foresight to cover our woodpile the previous evening, we had dry wood for a fire over which two grills were placed on stacks of concrete pavers. This, too, was an improvement over last year’s one-grill setup in the muddy driveway. And it’s a good thing, because it became clear after a few hours that we were going to be at this awhile longer than anticipated. A day longer, to be exact. The oxidation in our giant copper pot did not disappear after a winter in the attic, so this year we boiled in two aluminum roasting pans. Those things are tough. 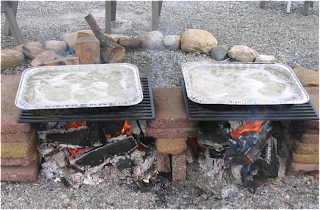 I was concerned that after hours over an open fire the pans would sprout giant holes in the bottom and we would watch our sap douse the fire. But no, the pans gave us all they had, showed us what they were made of, left it all on the grill. After a full day under a canopy tending a smoke-in-every-exposed-pore, ash-in-your-nose kind of fire, we still had sap to boil. We folded our canopy, reloaded the coolers with the remaining sap, brought what we had boiled indoors, and cleared the next day’s calendar. Day 2 of production, while unanticipated, was a good one. With sap once again boiling outdoors, the indoor boiling of the previous day’s effort began. This took a long time, and I started to wonder if our propane company made emergency deliveries. Although we brought the operation indoors a bit too early, we were much better at the finishing process this year. I base this assessment on the fact that our final product is indeed syrup and not a glob of maple candy. The smell, the texture, the color is all just right, and the syrup has a smoky flavor that we think makes it distinctly ours. It will be much easier to share our efforts this year as we beat out last year’s one-cup yield by about 10x, an amount that we take great pride in referring to as over half a gallon. There was no chest thumping, no thrusting of pointer fingers in the air, no group-hugging on the floor, but we do feel like syrup champions this year. Second-time tree tappers Sara Bonthuis and Pat Sullivan moved from the suburbs of Washington, D.C., to Stamford, Vermont, in 2007. Sara is a writer, photographer, and landscape designer who is a Vermont Master Gardener and a driver for Berkshire Organics.